I have never had a child get so committed to potty splashing. The fact that we have three bathrooms now adds to it. I think also the fact that two three -year-olds are in and out of said three bathrooms all day. 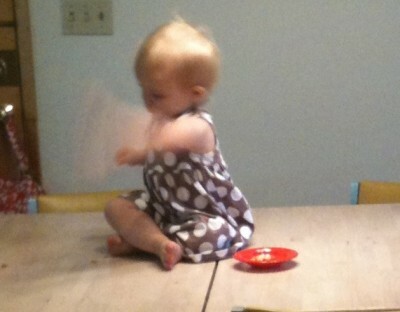 Add to that the fact that Blaire is apparently part mountain goat: scaling tables, laundry piles, and chairs in no time. She could be on any floor at any time, getting into any potties. She’s fast, that one. Cute as a button – thanks for sharing.. This reminds me of my own one-year old! He’s so opposite of my first-born (now five), with whom I could put in the middle of the room with some toys and find him still sitting and playing in the same place 30 min. later. But not Son #2! Just like Blair, he’s into EVERYTHING — fast! One of his favorite things is “calling Nana on the phone.” The other day as I was putting away laundry, I heard him babbling, only to find him “talking to Nana” over my electric razor. Yikes! ohhhhhh, potty splashing. The twins are almost 2 now, and if they are let into the bathroom, they are sure to be splashing… hopefully the toilet was flushed- ick! I remember when I let the twins up stairs recently with the”supervision” of the older siblings only to find Molly with a cup dumping toilet water all over the hardwood floors in the hall and Henry dipping his hand in the toilet for a little refreshment. You never know what to expect! cute! i’m thinking of throwing my dinner all over the floor tonight. blaire and my baby both seem to think it’s super. my favorite is when you get messy baby hands (and feet) in your hair while you try to clean up underneath their seat. This post, as cute as it is, brings up questions in my mind. Are the kids opening the toilet lids and then playing in the water, or are the toilet lids left open? If the former, wow, I didn’t realize kids that age were so strong. Best of luck convincing them to leave the toilets alone. If the latter, why are you leaving drowning hazards available for your kids to fall into? Oh my goodness! I can so relate!! How fun. 🙂 I’m glad my daughter isn’t the only one with this tendency!